Web-based, portable, next generation, mobile, accessible, post-modern, evolutionary … the list of alluring marketing adjectives that describe Cloud ERP solutions is endless. But what exactly is a Cloud based ERP solution? 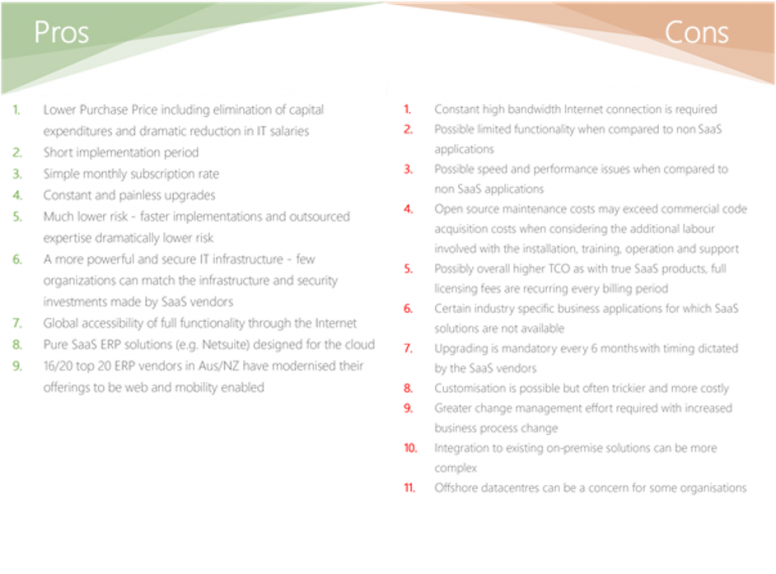 What benefits do they have over “traditional” ERP solutions? And are they right for your business? ERP providers are jumping on the cloud wagon and are now either already providing cloud based solutions or are in the process of developing cloud based solutions and add-ons. Cloud computing has taken the technological world by storm and it is no surprise that ERP has followed suite. As such, many CIO’s are considering whether a cloud based ERP is the logical step forward for their organisation or not. However, one thing is certain, the emergence of cloud based ERP solutions has added another layer of complexity in the ERP selection process and as such there are some questions that you should ask yourself before you consider whether the “new wave” of ERP solutions are right for your business. There is little difference these days between Cloud based ERP systems vs Traditional ERP systems in terms of functionality. However, Cloud based systems are an on-demand self-service Internet infrastructure where you pay-as-you-go and use only what you need, all managed by a browser, application or API. The basic premise of the service is that all processing, data storage and maintenance activities are performed in ‘the cloud’ or shared mainframe, and accessed via the internet. Infrastructure as a service (IaaS): Virtual servers only. Platform as a service (PaaS): Servers and processing power, along with a set of development tools which are also hosted on said infrastructure. Software as a service (SaaS): The most popular type of Cloud service for ERPs, this is where the vendor not only provides the hardware infrastructure, but also the complete developed software solution that the user need only access via a front end web portal. Cloud ERP’s are a viable option for some organisations, however there are multiple vendors who now provide Cloud Solutions adding even more complexity to selecting the right solution for your organisation this is why at Solution Minds our experienced Consultants follow a robust selection methodology and approach to help you decide whether cloud based solutions are the best fit for the functional and technical requirements of your organisation based on your business processes and overall business and IT strategy.